The Dublin native's first day in the top role at the Omnicom Group agency is today. ST. LOUIS: John Saunders, president of FleishmanHillard’s EMEA region, is replacing Dave Senay as the firm’s president and CEO, effective on Wednesday. Saunders will move to St. Louis, the Omnicom Group agency’s base, for the role. Dale Adams, chairman and CEO of the DAS Group of Companies, the division of Omnicom that contains Fleishman and other PR firms, said in a statement that Saunders "emerged from a year-long leadership evaluation process and stood out in many respects." "In today’s ultra-connected world, [Saunders] will help FleishmanHillard link its employees and clients with the many best-in-class companies that are part of the Omnicom/DAS network of companies," he added, in the emailed statement. Senay, who has worked at Fleishman for 32 years, will serve as a consultant to the agency and support its leadership transition, it said in a statement. He joined the firm in 1984 and was named to its top job in July 2006, succeeding John Graham, who became the agency’s chairman. Senay has also served as chairman of the PR Council for two terms. He was ranked number 16 in the 2015 edition of PRWeek’s Power List. Saunders, a Dublin, Ireland, native, was appointed as regional president for EMEA in 2011, after being named regional director for Europe seven years earlier. He founded Fleishman-Hillard Saunders in 1990. In 2014, Fleishman achieved high-single-digit organic global growth, compared with 2013, and organic growth in the low teens in the Americas. Senay said at the time that the shop had "one of the healthiest margins in the history of the firm" last year, as well. More recently, Omnicom’s PR firms saw an organic revenue decrease of 1.5% in the third quarter to $336.4 million, compared with the prior year. The group’s organic growth was flat at 0.6% in the first nine months of the year. Senay said about the quarter, "After a strong first half, when we exceeded plan, the third quarter did not keep pace." 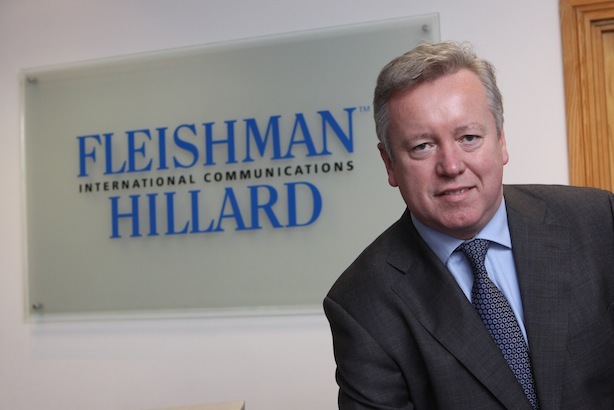 Earlier this week, FleishmanHillard and Fishburn confirmed plans to merge their UK operations, creating a new entity called FleishmanHillard Fishburn with more than 200 staffers. The combined firm will begin using the new branding in January. Jim Donaldson, MD of Fleishman’s UK operations, is set to become CEO of the merged firm, with Fishburn leader Ali Gee taking on the role of deputy chief executive. Fleishman has seen a number of major personnel changes in the past year. In August, former Fleishman global vice chairman of operations Guillaume Herbette left the firm to take over the dual role of MSLGroup CEO and EVP of Publicis Worldwide. He succeeded Olivier Fleurot as MSLGroup’s chief executive, reporting directly to Publicis Worldwide president Arthur Sadoun, who had taken over direct supervision of MSLGroup. Fleishman has also named new GMs for its New York and Los Angeles offices in recent months, appointing Ephraim Cohen and Mitch Germann to the respective roles. Both are reporting to JJ Carter, Fleishman’s president of the US East and West regions, Canada, and Mexico. Robert Dowling, former Fleishman US East Region president and GM of New York, left the firm in May to pursue other opportunities. Neither Senay nor Saunders could be immediately reached for comment. This story was updated on November 4 with additional information. It was updated again to change the name of the Council of PR Firms to the PR Council. FleishmanHillard Fishburn: A marriage of convenience or a match made in heaven?